I embark on my review of 2014 with a degree of trepidation, as this year did not turn out to be quite as joyful as I hoped it might be. The two preceding years were gloriously packed with exotic travel and big events, so in hindsight 2014 was probably never going to live up to expectations. There have been many sadnesses, including the passing away of my granny and great aunt, marking the end of an era in the Cooper family. Work has been all consuming for us both and we have not enjoyed our usual ‘big’ holiday. In retrospect this may have been a sacrifice too far as we love our sun and adventure. Yet one great happiness, the arrival of my niece Martha, rescued 2014 from the doldrums. I’d re-live all of the last twelve months just for that life-changing event. Happily the two generations, Great Granny Cooper and little Martha, were able to meet before their ways parted again. Martha will be one year old on January 3rd and is an ever-moving bundle of joy, laughter and smiles. Meanwhile The Frustrated Gardener has gone from strength to strength, thanks to all the people who looked in regularly, or even dropped by just the once. It matters not, as the views, comments and likes are what have kept me going through a year of ups and downs, and will propel me into 2015 with as much gusto as I started 2014. Thank you for looking in and I hope you enjoy my review of this year’s best bits. 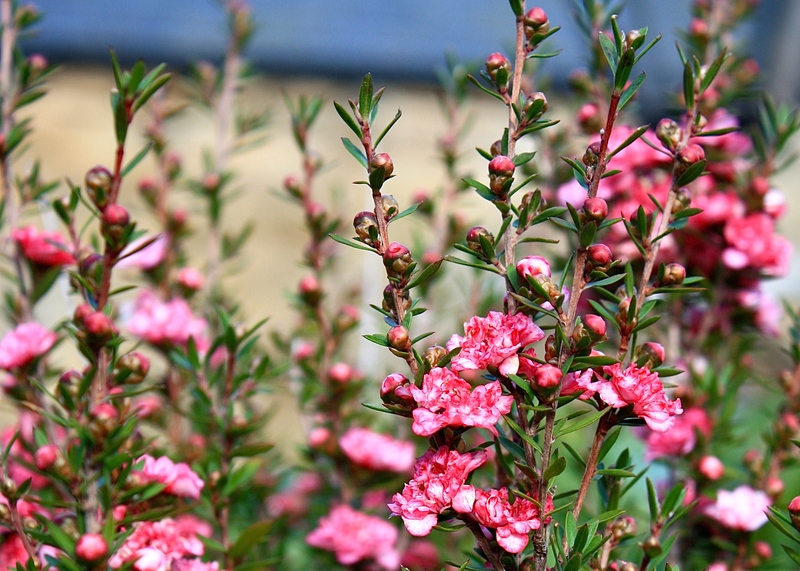 There is no denying that 2014 was a vintage year for gardening, garden visiting or simply being outdoors. The UK escaped with a mild but very wet winter, followed by a lovely spring, summer and autumn. 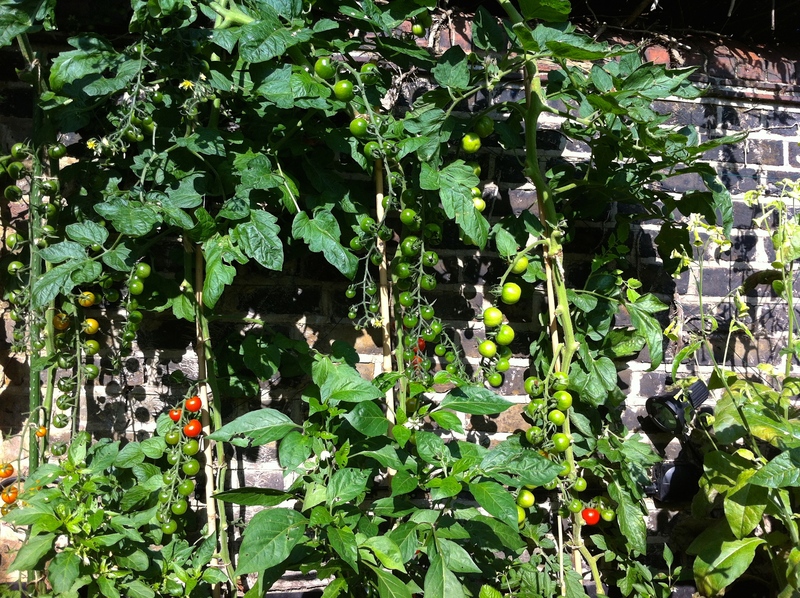 The growing season in both of our gardens was long and productive, creating an equal abundance of flowers and foliage ….. and for the first time in London there were fruits and vegetables too. In January, following the birth of baby Martha, we made the first of three visits to Cornwall. 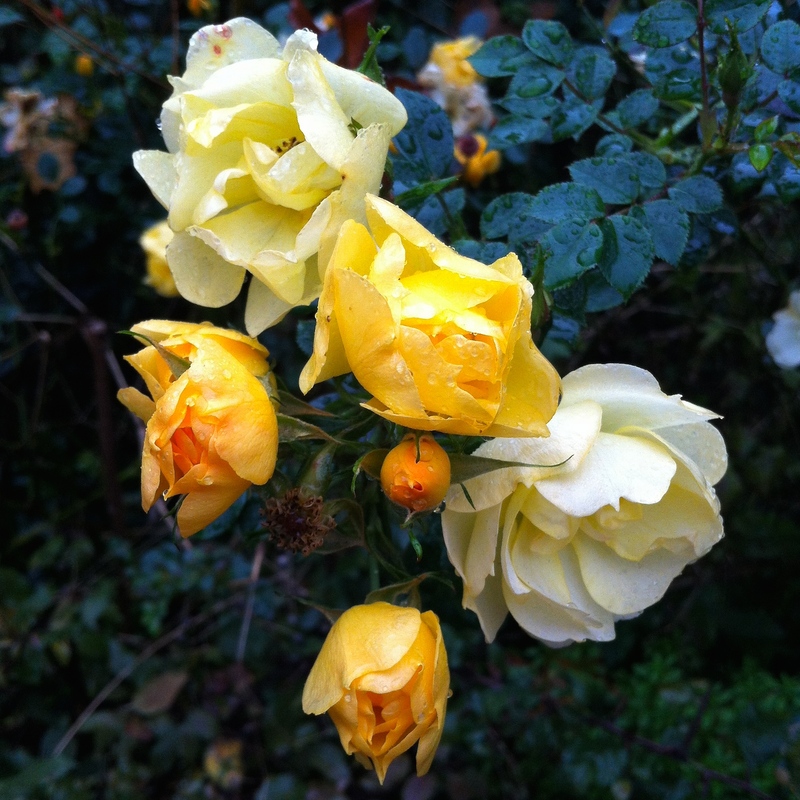 There, in the depths of winter, we discovered camellias, daffodils and leptospermums in full bloom. More incredible still was the profusion of aeoniums sprouting from walls and pots in St Ives’ narrow streets and alleyways. A second New Year highlight was the brilliant Hellebore Day at Bosvigo in Truro, the event which kicked off my gardening year. I took the sleeper train from Paddington, arriving in Camborne at the crack of dawn, and just had time to freshen up at Trevoole before joining the long queue for Wendy Perry’s hellebore bonanza. I purchased four beautiful seedlings from Wendy’s ‘Bosvigo Doubles’ strain and gave them all pet names in order that I could identify them in future. I am excited to see their richly ruffled blooms again in 2015, especially ‘Blackberry Fool’ and ‘Eton Mess’. 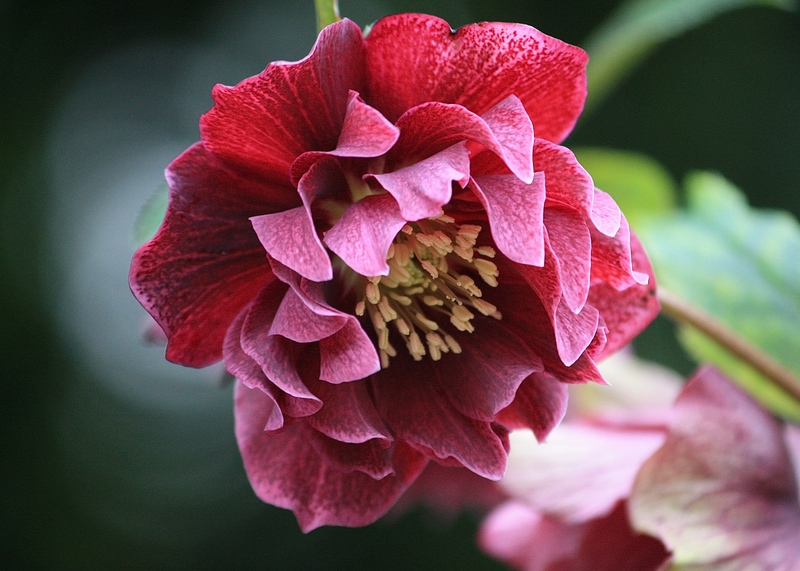 Wendy’s next hellebore day is on Saturday February 21st, 10am-4.30pm. 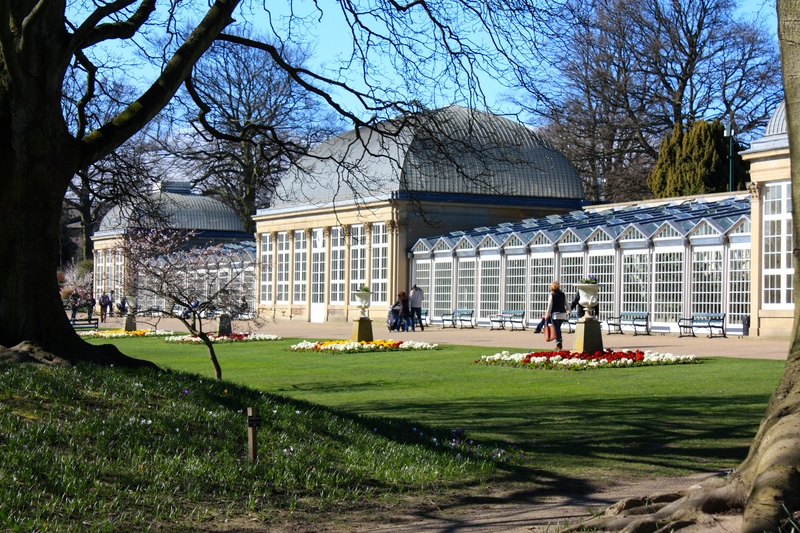 March saw us travel up to Sheffield for a family birthday celebration, offering us the chance to visit the city’s wonderful Botanical Gardens. 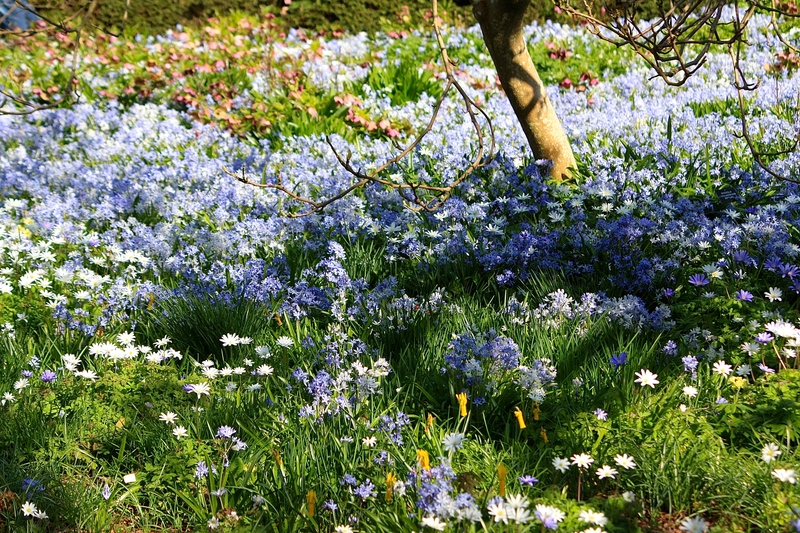 We were blessed with exceptional weather and greeted by swathes of hepaticas, crocuses, polyanthus and oxlips. It is heartwarming to witness the renaissance of public parks such as Sheffield Botanical Gardens, when as recently as the 80’s and 90’s so many seemed doomed to become drug-blighted, no-go areas. As the UK economy improves, it’s to be hoped that councils apportion an appropriate amount of their funds to the continuous improvement of our precious green spaces. To my mind one can never pay enough visits to Sissinghurst, which truly deserves its matchless reputation as a garden of great beauty, style and plantsmanship. I visited three times during 2014, which further proved to me what a remarkable job the Sissinghurst team make of keeping this famous garden looking tip-top year-round. 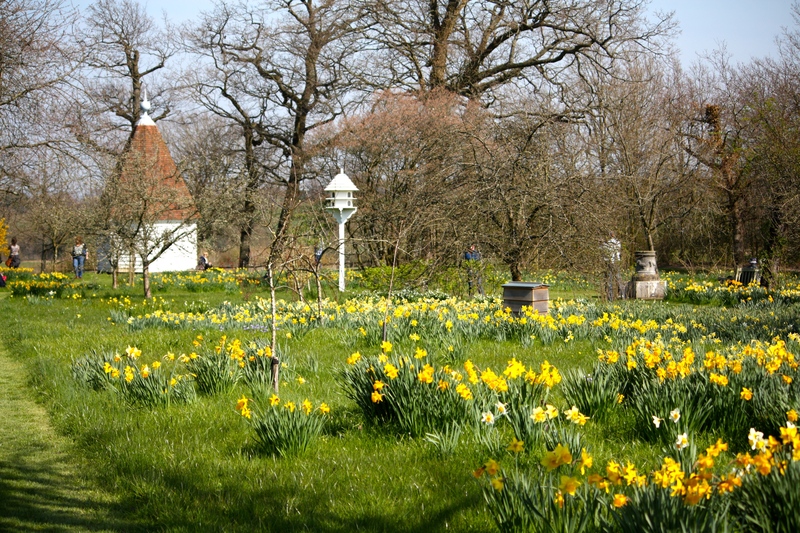 I am ashamed to admit that I never got around to writing up my April sortie, when the orchard and Delos were blanketed by a delightful patchwork of narcissi, anemones, fritillarias, scillas and hellebores. It was a lovely day, with fewer visitors than one encounters later in the year. As always at Sissinghurst I was dazzled by the accomplishment of the plant associations, one of Vita Sackville-West’s many legacies which endure through today’s gardening team. A very special combination was Chaenomeles x superba ‘Knap Hill Scarlet’ set against the weathered brick and silvered oak of the Tudor castle. 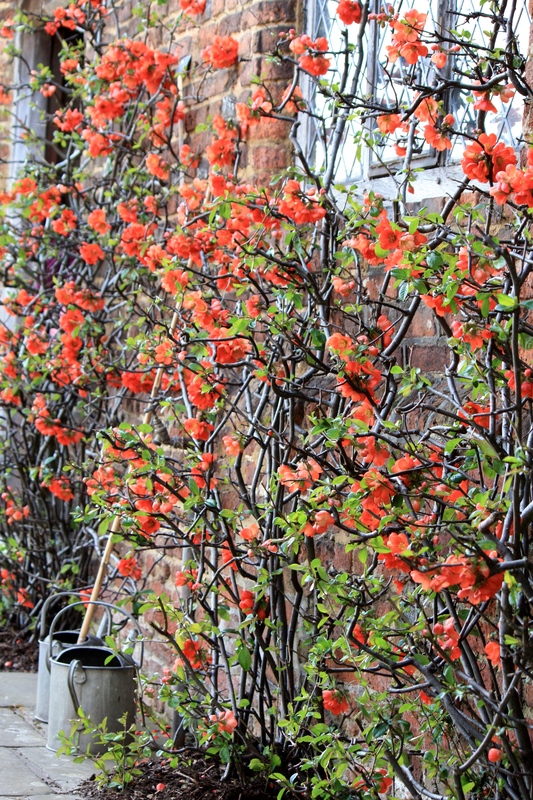 The Japanese quince’s colour is more tangerine than scarlet, but is exquisite next to its emerging lime-green leaves and the terracotta-tinted walls. 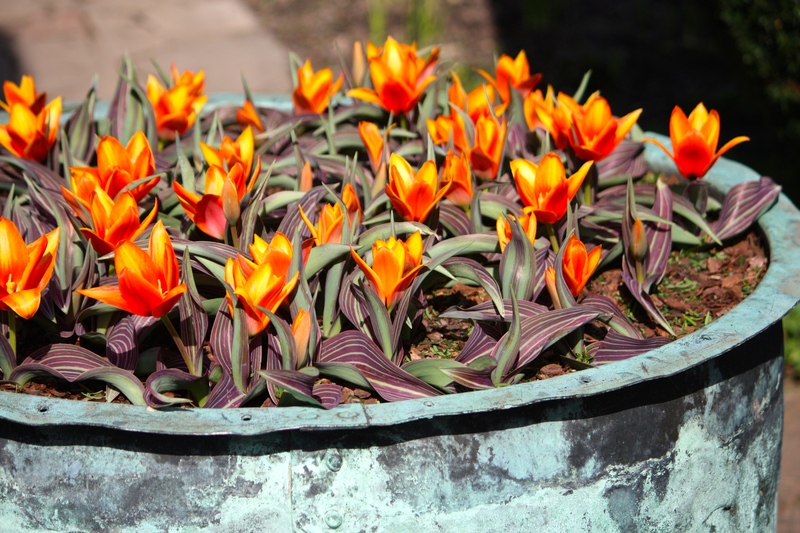 Equally stunning and thoroughly modern was the dazzling pairing of fiery greigii tulips with the verdigris-coated urn at the centre of the Cottage Garden. 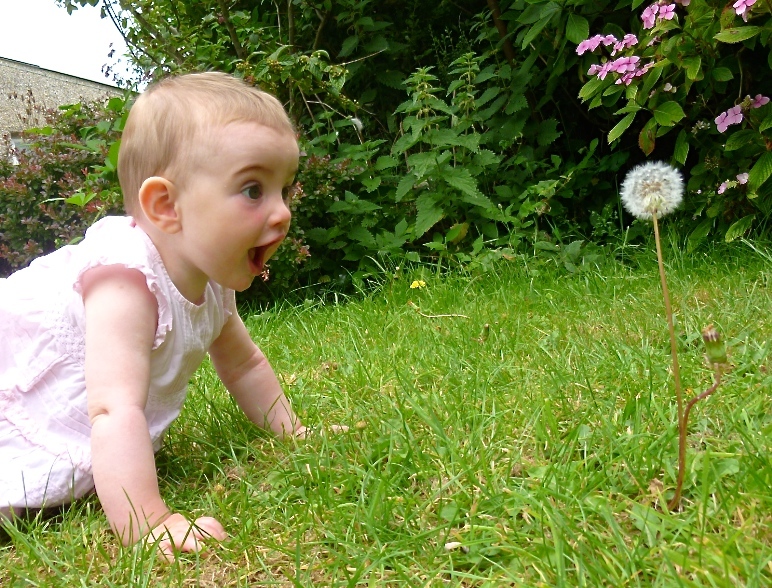 May is the month when The Frustrated Gardener gets more visits than any other. For the first time I took a week’s holiday for Chelsea and immersed myself in this greatest of all flower shows. There was much remembrance of the start of the Great War, both in show gardens and the Great Pavilion. This sobering theme was continued through many other RHS shows in 2014, a poignant reminder of the devastation, suffering and loss experienced in a conflict that began 100 years ago. 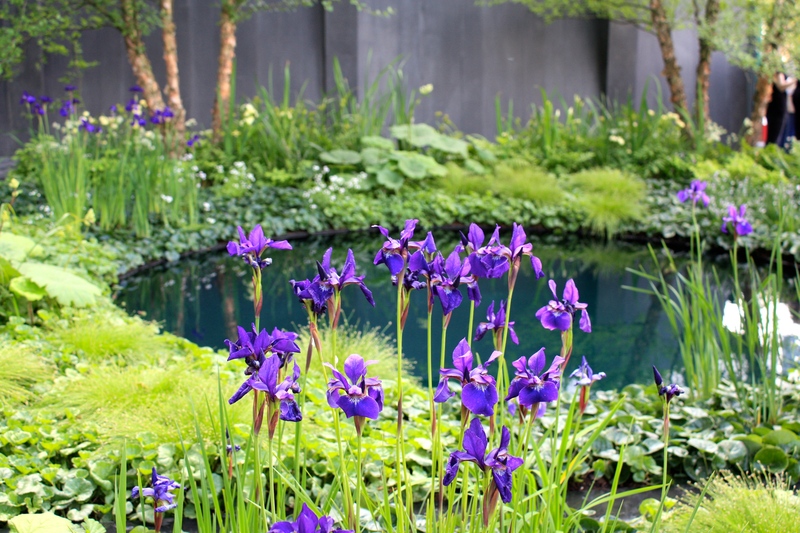 Featuring blackened water and Iris sibirica (both widely employed at this year’s Chelsea), Charlotte Rowe’s brooding pool represented a crater left by an exploded bomb. My ‘most read’ post of the year was my write up of The Telegraph Garden designed by Tommaso del Buono and Paul Gazerwitz. When I look back on my photographs I love this garden just as much, if not more, than I did back in May. Those saturated greens and cool blues are right up my street, and I admire the careful balance achieved between structure and informality. 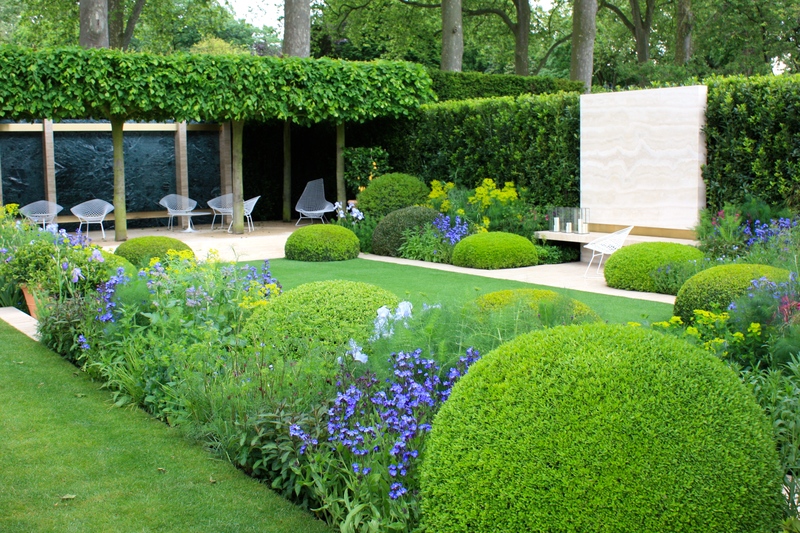 It’s not a garden I’d care to maintain – too much precision trimming required – but I could enjoy it endlessly, especially with a glass of Veuve Cliquot in hand. Later that week, with my Aussie friend Helen, I visited Sissinghurst once again, but it was lesser known Goodnestone Park (pronounced ‘Gunston’) that captured my companion’s imagination. 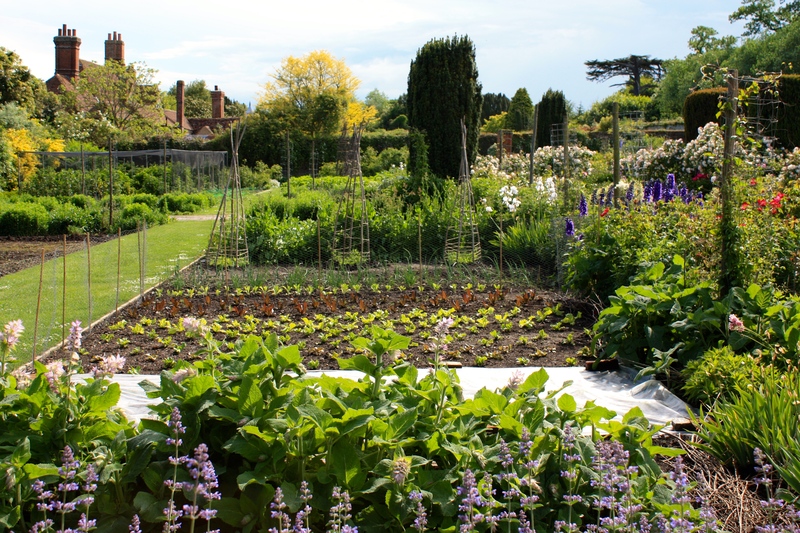 It may have been the roses, it may have been the bucolic vegetable garden, or it may have been the chatty head gardener, but we came away thoroughly inspired by this magical Kent garden and appreciated the relative absence of other visitors. 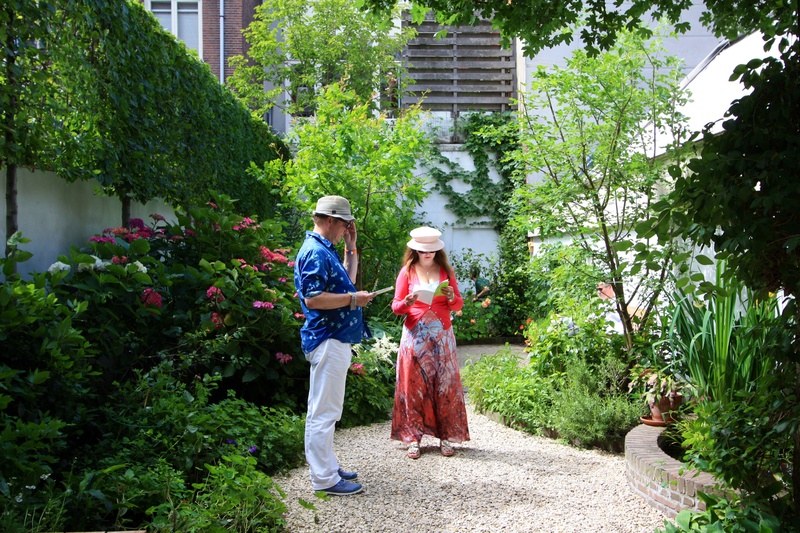 June saw us visit Amsterdam, me for the first time, to enjoy the city’s open garden weekend. 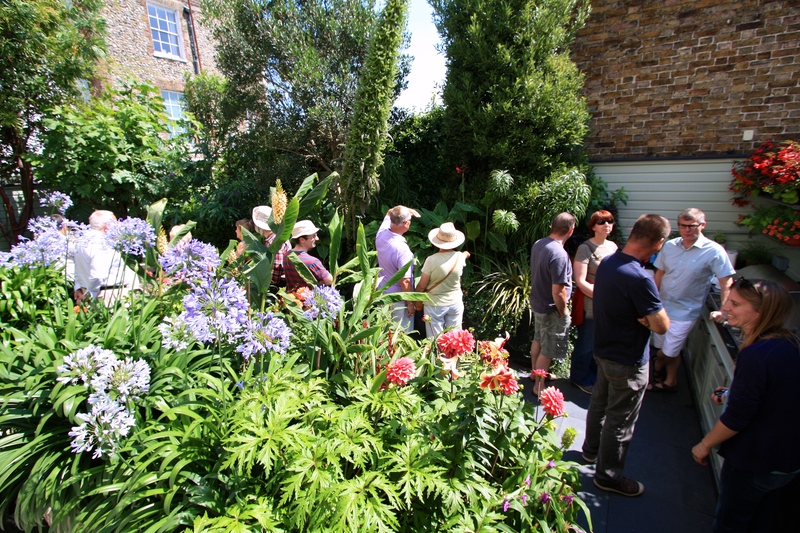 We were blessed with great weather and found the whole event a fantastic introduction to Dutch garden style. 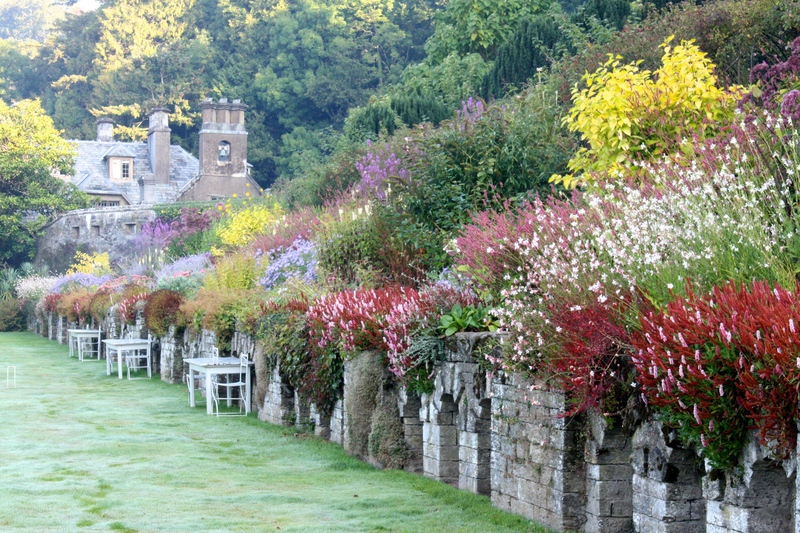 Approximately 30 gardens opened their gates to the public, varying from grand museums to small domestic plots. For anyone challenged by narrow, shaded or dry spots it’s great to see what others have achieved in the same conditions, and the refreshments on offer aren’t bad either. Amsterdam’s gardens open once again in 2015, June 19 to June 21 inclusive. 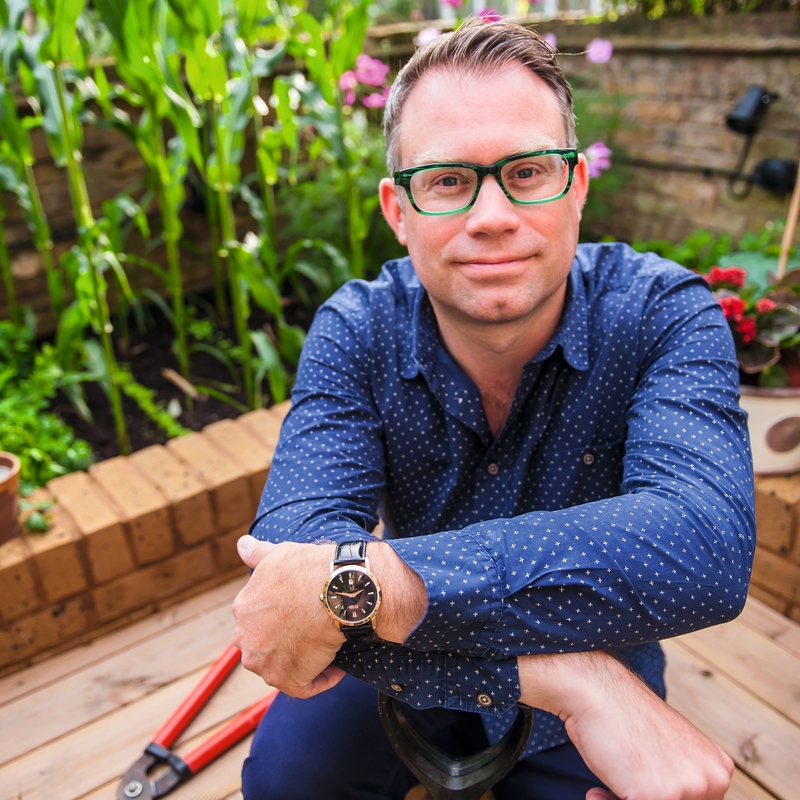 Late June brought upheaval to our London garden when we embarked on the particularly ill-timed construction of raised vegetable beds, utilising a spot which had been neglected for a couple of years. Furthest away from the building, the designated spot receives plenty of sun, so we chose to incorporate seating for those balmy summer evenings. Despite having to lug over 300 bags of topsoil and compost through the flat, we had it planted up and ready to go by the second week in July. Although the sweetcorn and courgettes didn’t quite hit the mark, we enjoyed as many herbs, tomatoes, salad leaves and beans as we could eat. Hampton Court Palace Flower Show was excellent this year and I declared Paul Martin’s exceptional garden, entitled ‘Vista’, my best in show. 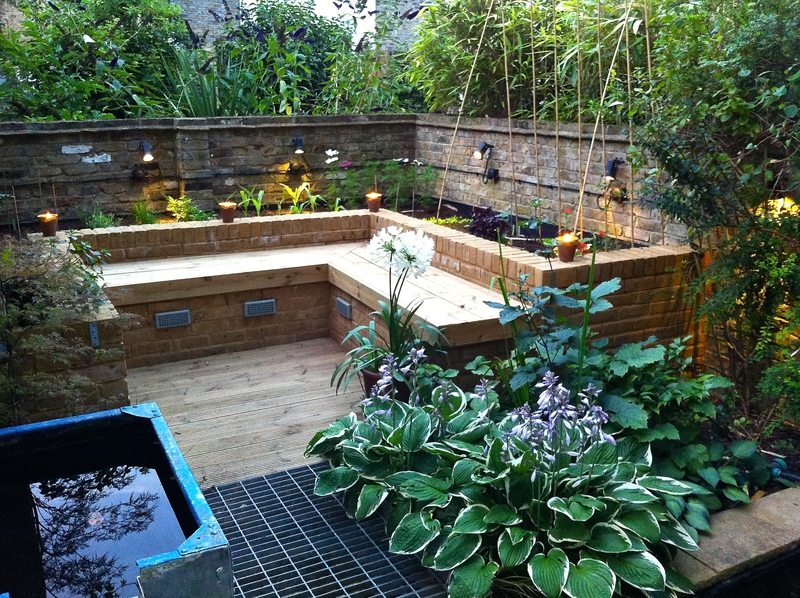 It had all the elements I love in a garden – generous entertaining space, ebullient planting, modern materials and close attention to detail. 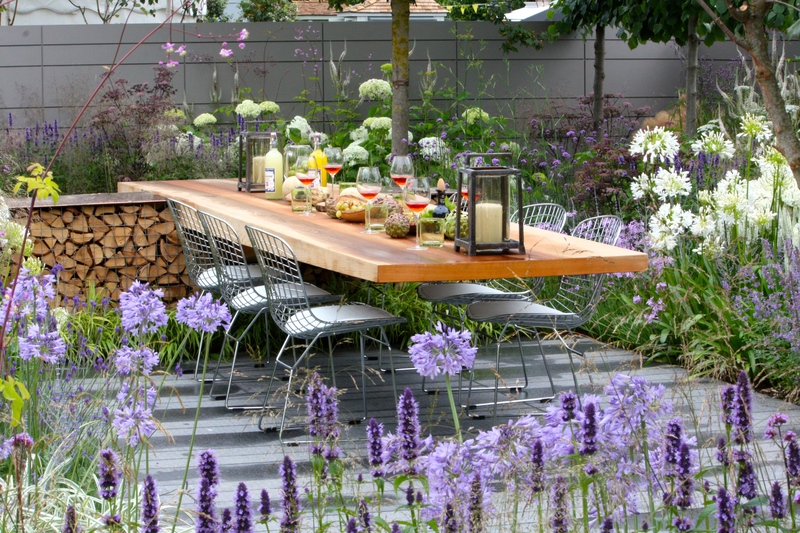 The cantilevered table was to die for, although if I were the host I’d have been topping up those glasses of rosé pronto. 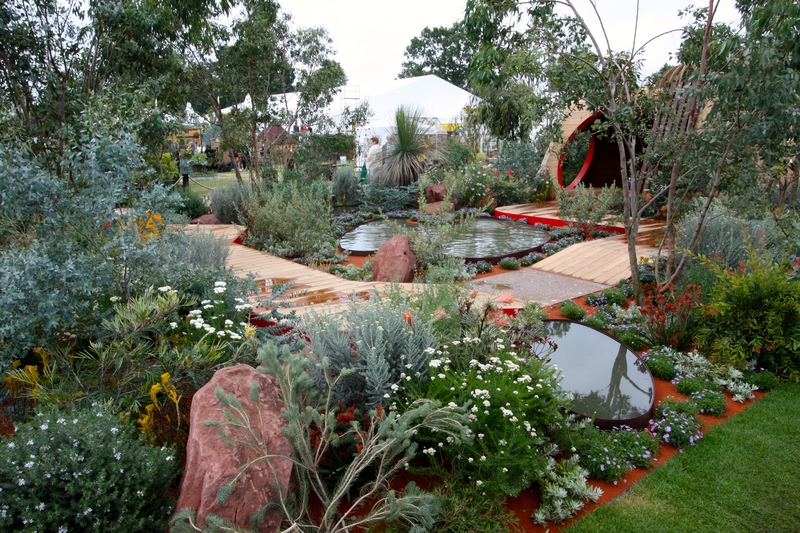 It was good to see Australia represented again at an RHS show, after we waved goodbye to Flemings at Chelsea in 2013. Jim Fogarty showcased the diversity of Australian flora in a garden full of colour and movement. One thing had been on my mind all year, and that was the opening of our garden for the National Garden Scheme. It seemed such a good idea when our friend Beth suggested it back in September 2013, but as the big day approached the pressure mounted. Sometimes the moon and stars align and this was one such occasion. The sun shone, the flowers bloomed (many for the first time this year) and the people came – 220 of them in the space of 2 days. What struck us was how friendly, kind and considerate all our visitors were and how far people were prepared to travel to see a garden measuring just 20ft x 30ft. When the sums were done we had raised almost £700 for the NGS charities, which is an amazing figure. None of this would have happened were it not for a small band of people who publicised the opening and helped out on the gate and selling refreshments. 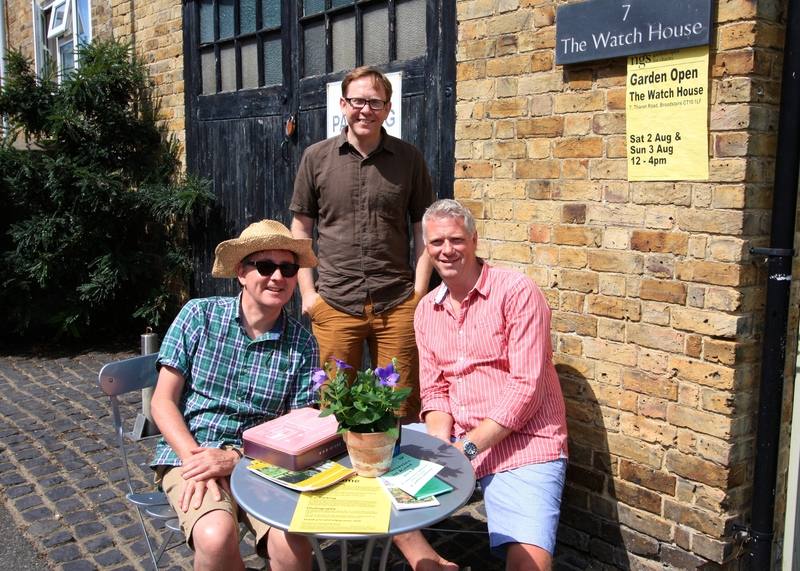 We’ll be opening The Watch House again in 2015 on August 1 and 2 and hope for another fine turnout. Late summer was not without its happier moments. We enjoyed three nights of luxury at Hotel Endsleigh, Devon in a room that looked out over the magnificent long border, reputedly the longest unbroken expanse of herbaceous planting in England. Whilst other guests arrived by helicopter, we had to make do with conventional wheels. Soft top down, we crossed the county to visit Cliffe and Gill Heavens, fellow blogger and author of Off The Edge Gardening. 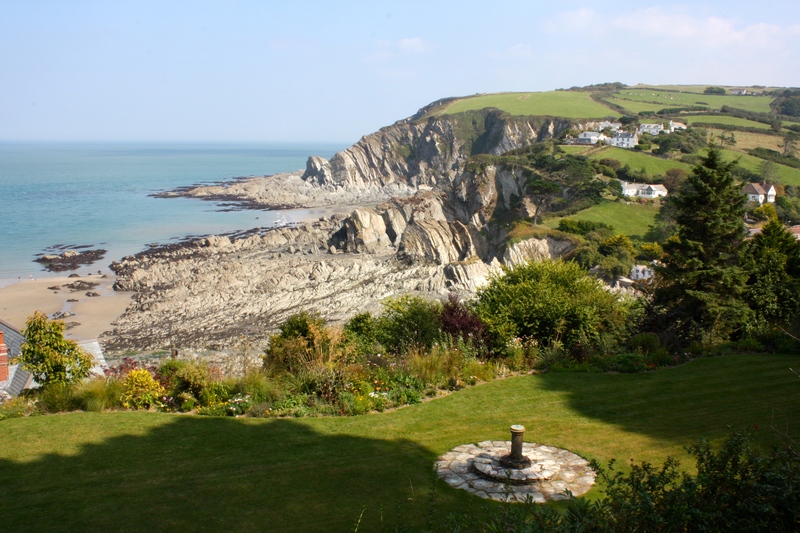 Now there is a garden with a view and a gardener with a wealth of knowledge. As usual, most of October was spent working in China, so it was great to return to two gardens still going strong. 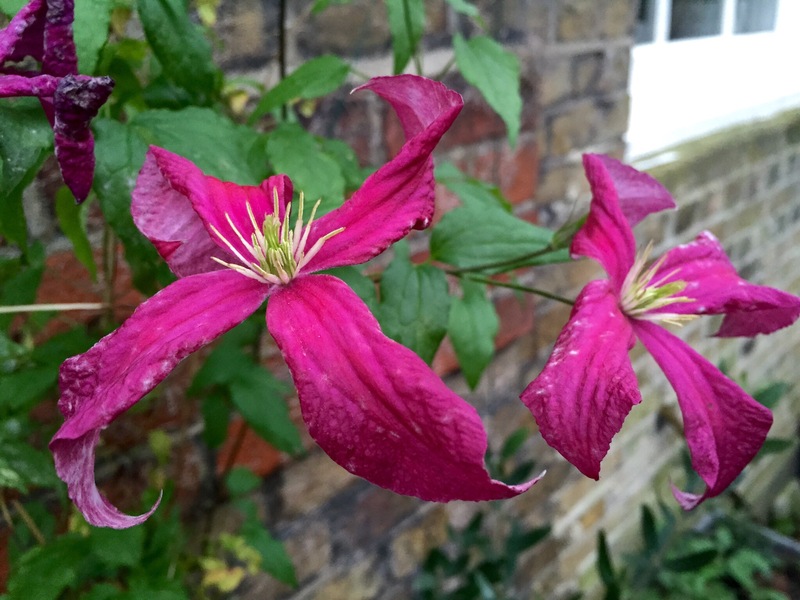 Having been blighted with mildew through the summer, Clematis ‘Madame Julia Correvon’ came into her own in October and was still blooming on Christmas Day. She was joined by Anemone ‘Wild Swan’ and Eomecon chionantha, otherwise known as the snow poppy, despite normally blooming in May and June. Most of December was spent in bed, not relaxing, but recovering from a succession of unwelcome bugs. 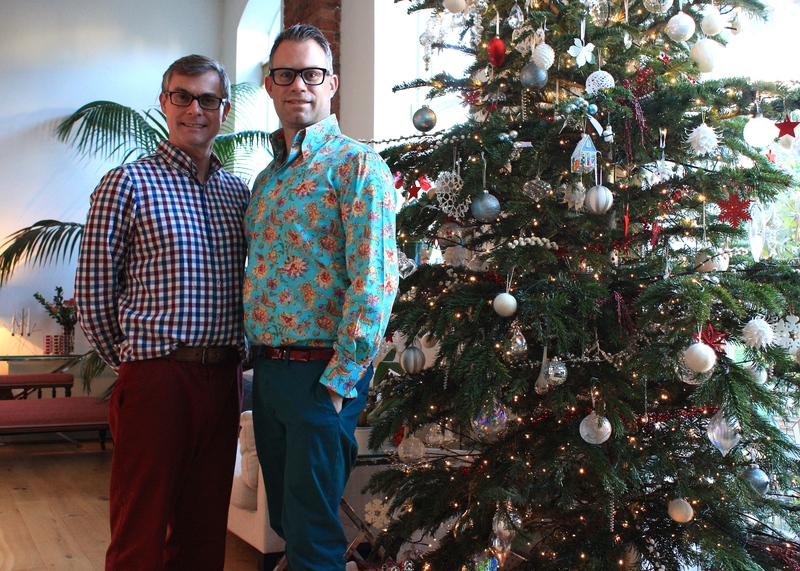 For the most part it was a month I’d rather forget, but by Christmas Day I was well enough to pose with Him Indoors for our traditional festive self portrait. You will spot on the right of the photograph a miniature greenhouse I bought for myself on a recent trip to Holland. Well, Father Christmas took the hint and delivered (albeit in 100 pieces) a tiny, lean-to greenhouse; the sort that stands against a wall but that one can’t actually go inside. It’s perfect for what I need and will allow me to start sweet peas early, bring on seedlings and give tender plants a little additional protection. All I need is time to put it together, and before I know it there won’t be an inch of staging left unoccupied. Thank you for reading this post and for joining me on my trip down memory lane. The going was a little rough at times and my suspension almost failed, but as 2015 approaches I can see open road ahead. I hope the same goes for you. Happy New Year! Hello! I found you via Helen. 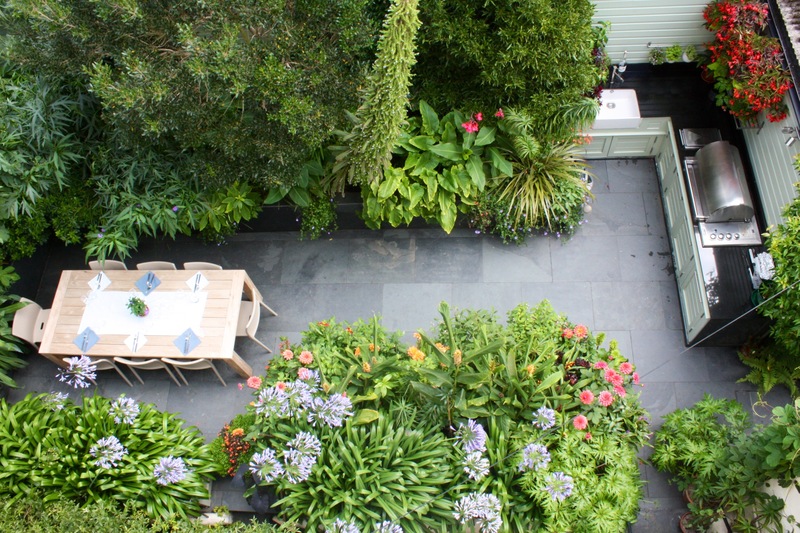 Fabulous garden and a great review of the year. I’m near enough to Endsleigh to avoid the need for a helicopter and have seen the long borders. They are magnificent too! May 2015 bring you and ‘him indoors’ much happiness, good health and joy and I look forward to our Hampton Court adventure! A great review of your gardening year. What fabulous gardens you visited. Happy New Year! Beautiful collection of photos!! I love it. If this means anything to you, I nominated your blog for the One Lovely Blog Award. Check out my home page for details. Keep up the stellar work and here’s to another year of getting our hands dirty!